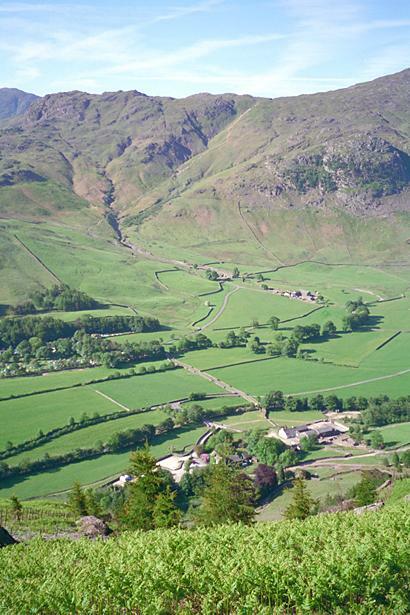 The head of the Langdale valley with The Old Dungeon Ghyll Hotel and Middle Fell farm below is here seen from the slopes of Loft Crag. Across the valley the road goes uphill and to the left from Wall End, a small grey building. The path to Pike o'Blisco leaves the road just to the left of the ravine of Redacre Gill. It crosses the Gill above the lower part of the ravine, and can be seen as a yellowish line rising diagonally to the right, to emerge on the horizon just right of centre. Smaller version of this picture.